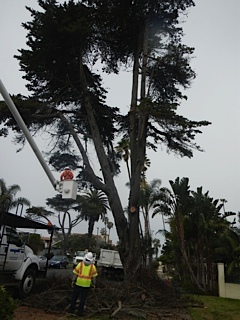 A local OB activist has saved a large Cypress tree on the 4900 block of Del Mar Avenue from being cut down … and for the moment, the tree appears to have been saved. 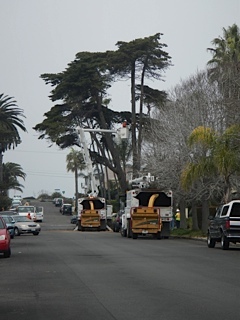 The tree at 4958 Del Mar Avenue had received a complaint from a neighbor across the street. Although, it looked healthy, and appeared to have new growth from the recent rains, our activist friend spoke to a city arborist who told her the tree crew was taking it out. But to our friend, it looked like one of the healthiest in the area, and perhaps needed some trimming. When the city-hired crew was informed that any tree in the public right-of-way taken down had to have paperwork and approval by the OB Planning Board. Once informed that they to go through a process, the crew only trimmed the dead branches off and pledged that they go through the process. This process was set up a while ago, when a Torrey Pines Tree was saved from death over on the 4600 block of Long Branch Avenue. This was back in January 2011 when the Planning Board voted to save it after local activists complained and fought to save it. One of the many reasons I love OB and Point Loma…the old beautiful trees throughout our community. Who has two thumbs and appreciates a fellow Tree Hugger making sure a healthy tree was not removed unnecessarily from our community? This girl!